ProSieben or your naughty alternative of choice. 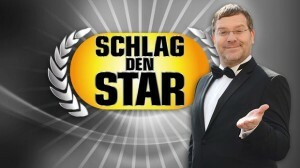 Join us for another exciting edition of Schlag den Star where once again two celebs will be battling it out over 15 mystery events for €100,000. If you’ve got a microphone you’ll be welcome to join us and hangout in the Hangout – link will appear here soon after the show starts. This episode, musician Sasha takes on TV chef Tim Mälzer over 15 events for Elton’s €100,000 briefcase. Announced musical acts include THE Herbert Grönemeyer and also ZAZ and Sigrid! The link to the commentary stream will be live here from 7:15 until end of broadcast. This stream is commentary only. You will need to have a naughty stream running at the same time for the visuals. We are likely to be about 15-20 seconds behind the visual stream (and about a full minute behind if you’re watching an actual satellite feed), sorry. The Opera VPN has apparently stopped being useful for SdS. Bother’s Bar recommends shelling out for a proper VPN service. Bother’s Bar uses Tunnelbear, other VPN services are available. Matt Clemson recommends Windscribe as a free alternative. We cannot take responsibility for anything you do to your system, so be careful and use some common sense. To watch it would be useful to sign up for ProSieben’s catch-up service – it’s pretty simple to work out, don’t click the box if you don’t want e-mail messages. You will need to put in a proper e-mail because it will send you a confirmation. If anyone knows of any relatively safe livestreams, do feel free to share. Next one is the 16th March – Singer Lucas Cordalis vs ex-Bachelor Paul Janke. Great fun episode tonight – sometimes the prospect of a five hour commentary fills me with slight dread, but they found two great contestants and although he was a bit useless at basically everything, I would absolutely watch Schlag den Malzer on a regular basis. They picked the wrong chef, evidently. Interestingly, they put out a casting call for a show called ‘Schlag den Besten’. No idea when it will debut, but it pits normal contestants against each other for a prize of €50,000. If a contestant wins, they come back the following show and so on (winner stays on). Ooh, I could see Besten working quite well, actually. If they find a really good player, they could become the new Raab. The impression we got for Besten is that it sounds like a Summer pre-recorded series, although that’s complete conjecture on our part. Last night had the show’s best rating for years I gather. 1.15m (16.4%) in 14-49 viewers. Best total audience since October 2016 when they had just as entertaining a pair as last night (gymnast Fabian Hambuchen vs comedian Bulent Ceylan). I thought it would be around that, especially after how entertaining last night’s show was. I doubt March’s episode will get that kind of number, but it’s a positive start. Having had a chance to think about it, there’s no reason why they couldn’t do a ‘Schlag den Mälzer’ – but only if he takes on other celebrities. If Raab put Mälzer through a performance bootcamp and he was up for doing the show, then it would be just as fun and interesting as last night. Definitely worth a shot. Prosieben haven’t said anything about Besten yet except for that it will ‘take a bit of time’. I’ve thought for a while that the quality (and ratings) of Schlag den Star depends hugely on who the celebrities are, and this proves it. And this is the winner!